Around 1 in 5 people need to re-register under the new system of Individual Electoral Registration, which has now replaced the old ‘head of household’ registration system. 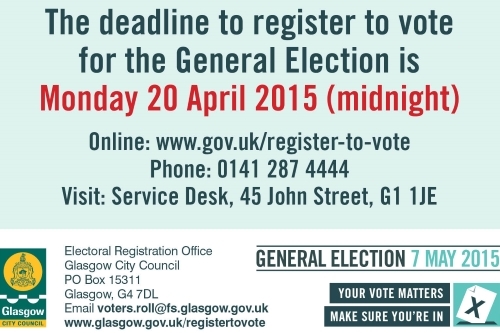 The Register to Vote deadline for the forthcoming general election is Monday 20th April 2015 (midnight). You can register via www.gov.uk/register-to-vote, by calling 0141 287 4444, or by visiting the service desk at 45 John Street, Glasgow G1 1JE. Dennistoun Community Council are seeking to fill one vacancy.